Respiratory Care Services, Massachusetts General Hospital, Harvard Medical School, Boston, Massachusetts. In recent years, there has been increasing interest in the use of noninvasive ventilation (NIV) in the post-extubation period to shorten the length of invasive ventilation, to prevent extubation failure, and to rescue a failed extubation. The purpose of this review is to summarize the evidence related to the use of NIV in these settings. NIV can be used to allow earlier extubation in selected patients who do not successfully complete a spontaneous breathing trial (SBT). Its use in this setting should be restricted to patients who are intubated during an exacerbation of COPD or patients with neuromuscular disease. This category of patients should be good candidates for NIV and should be extubated directly to NIV. In patients who successfully complete an SBT, but are at risk for extubation failure, NIV can be used to prevent extubation failure. These patients should also be good candidates for NIV and should be extubated directly to NIV. NIV should be used cautiously in patients who successfully complete an SBT, but develop respiratory failure within 48 hours post-extubation. In this setting, NIV is indicated only in patients with hypercapnic respiratory failure. Reintubation should not be delayed if NIV is not immediately successful in reversing the post-extubation respiratory failure. Evidence does not support routine use of NIV post-extubation. High-level evidence supports that noninvasive ventilation (NIV) should be standard practice for patients with either a severe exacerbation of COPD or cardiogenic pulmonary edema.1 In this setting, the application of NIV not only avoids intubation in many patients, but it also affords a survival benefit.2,3 In recent years there has been increasing interest in the use of NIV in the post-extubation period to shorten the length of invasive ventilation, to prevent extubation failure, and to rescue a failed extubation.4–6 The purpose of this review is to summarize the evidence related to the use of NIV in these settings, with a focus on randomized controlled trials (RCTs). There are a number of potential advantages of using NIV to allow earlier extubation (Table 1),5 although the use of NIV in this setting is controversial.6 Several RCTs have addressed the use of NIV to allow extubation of patients who failed a spontaneous breathing trial (SBT). Nava et al7 conducted an RCT to determine whether NIV can shorten the time of invasive respiratory support for patients with COPD. An SBT was conducted 48 hours after intubation. If this failed, patients were extubated directly to NIV or remained intubated on pressure support ventilation. Both groups received an SBT twice daily. After 60 d, 22 of 25 patients who received NIV were successfully weaned, compared with 17 of 25 patients who were ventilated invasively. The average duration of mechanical ventilation (invasive and NIV) was 17 ± 12 d for the invasive group and 10 ± 7 d for the NIV group. Survival rates at 60 d were 92% for patients who received NIV and 72% for patients who received invasive ventilation. None of the patients who were weaned with NIV developed ventilator-associated pneumonia (VAP), compared to 7 patients weaned while receiving invasive ventilation. Girault et al8 conducted an RCT in 33 patients who failed an SBT. Pressure support ventilation with an endotracheal tube was provided for the control group, and NIV was applied immediately after extubation in the others. The groups were similar in terms of the cause of their chronic respiratory failure, pulmonary function, age, Simplified Acute Physiology Score, and severity of acute respiratory failure. The successful extubation rates were similar in the 2 groups (75% in the group that was weaned invasively vs 76.5% in the NIV group). However, the duration of intubation was significantly shorter in the NIV group than in the invasively weaned group (4.6 d vs 7.7 d). Interestingly, NIV reduced the mean period of daily ventilator support, but increased the total duration of ventilator support. Overall duration of mechanical ventilation was higher in the NIV group (16.1 d vs 7.7 d). Ferrer et al9 conducted an RCT in patients who failed an SBT for 3 consecutive days. Patients were extubated to NIV (n = 21) or remained intubated following a conventional approach of daily SBTs (n = 22). 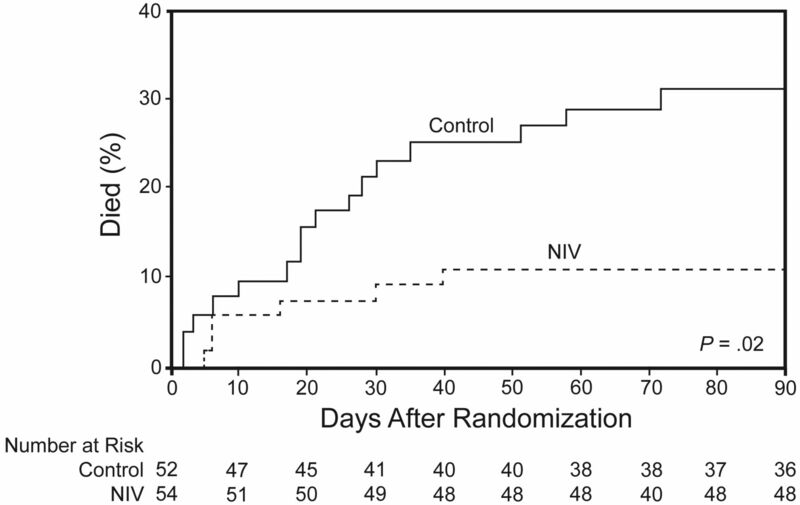 Compared with the invasively weaned group, the NIV group had fewer invasive ventilation days (9.5 d vs 20.1 d), ICU days (14.1 d vs 25.0 d), and hospital days (27.8 d vs 40.8 d). The NIV group also had less need for tracheotomy (5% vs 59%), lower VAP rate (24% vs 59%), and lower rate of septic shock (10% vs 41%). ICU survival was greater in the group that was extubated to NIV (90% vs 59%). The conventional weaning approach was an independent risk factor of decreased ICU (odds ratio 6.6) and 90-d survival (odds ratio 3.5). Burns et al10 conducted a systematic review and meta-analysis of randomized and quasi-randomized controlled trials to evaluate the evidence for extubation with immediate application of NIV, compared with continued invasive weaning. They identified 12 studies that enrolled a total of 530 subjects, most with COPD. Compared with invasive weaning, NIV was significantly associated with reduced mortality, VAP, ICU and hospital days, total duration of ventilation, and duration of invasive ventilation (Table 2). NIV had no effect on weaning failures or weaning time. The authors concluded that use of NIV to allow earlier extubation should preferentially be used in patients with COPD in a highly monitored environment. A paper by Girault et al,11 published after the review by Burns, evaluated NIV effectiveness as an early extubation technique in difficult-to-wean patients. This was a multicenter RCT conducted in 13 ICUs enrolling patients with chronic hypercapnic respiratory failure intubated for acute respiratory failure who failed their first SBT. Patients were assigned to 3 groups: conventional invasive weaning group (n = 69), extubation followed by standard oxygen therapy (n = 70), or NIV (n = 69). NIV was permitted as rescue therapy for both non-NIV groups if post-extubation respiratory failure occurred. Reintubation rates were 30%, 37%, and 32% for the invasive weaning, oxygen-therapy, and NIV groups, respectively. Weaning failure rates, including post-extubation respiratory failure, were 54%, 71%, and 33%, respectively (P < .001). Rescue NIV success rates for invasive and oxygen-therapy groups were 45% and 58%, respectively (P = .39). Apart from a longer weaning time in the NIV than in the invasive group (2.5 d vs 1.5 d), no significant outcome difference was observed between the groups. Although the authors found no significant difference in the probability of reintubation between the 3 weaning strategies, the study demonstrated that NIV improves weaning results by reducing the risk of post-extubation acute respiratory failure. It is important to appreciate that these results also suggest that rescue NIV might be useful to avoid reintubation when post-extubation respiratory failure occurs. A category of patients who benefit from extubation to NIV are those with respiratory failure due to neuromuscular disease. Bach et al12 recently reported successful extubation of patients with neuromuscular disease who did not meet criteria for ventilator discontinuation. Data were collected on 157 consecutive patients. None of the patients tolerated an SBT before or after extubation. All patients were extubated to NIV and aggressive assistance with coughing. Before hospitalization, 61% of the patients had no experience with NIV, 26% used it < 24 h/d, and 13% were NIV dependent. The first-attempt extubation success rate was 95%. NIV dependence and the duration of dependence prior to intubation correlated with extubation success. Of the 6 who initially failed extubation, 8 succeeded on subsequent attempts; only 2 underwent tracheotomy. Although this was not an RCT, it makes the point that patients with acute respiratory failure who require intubation can be extubated directly to NIV (and cough assistance) rather than progress to tracheostomy. The criteria to initiate an SBT must be satisfied. The upper airway should be patent. The patient should be able to clear secretions (with or without assistance). The patient should be a good candidate for NIV; able to tolerate the interface. The patient should be able to breathe spontaneously long enough to allow mask and ventilator adjustments. Extubation to NIV is discouraged if the patient would be technically difficult to reintubate. Extubation failure is defined as the need for reintubation within 48–72 h following extubation.13,14 In critically ill patients, extubation failure occurs in < 10% of surgical patients, but it occurs in 10–20% of medical patients.5,6,13,14 Extubation failure has been associated with several adverse outcomes, including a prolongation of the duration of ventilation and increased need for tracheostomy.5,6,13,14 The mortality associated with extubation failure is as much as 10 times that in successfully extubated patients. A number of studies have found that delayed time to reintubation is associated with increased mortality in patients with extubation failure (Table 3).15–20 That reintubation subjects the patient to increased risk of morbidity and mortality makes the application of NIV an attractive therapy to prevent extubation failure. A multicenter RCT by Nava et al21 was designed to assess whether early application of NIV, immediately after extubation, is effective in preventing post-extubation respiratory failure in an at-risk population. The study enrolled 97 patients considered at risk of developing post-extubation respiratory failure (Table 4). After a successful SBT, patients were randomized to receive NIV or standard medical therapy. The NIV group had a lower rate of reintubation (8% vs 24%). The need for reintubation was associated with a higher risk of mortality. The use of NIV resulted in a reduction of risk of ICU mortality, possibly related to the reduction in the need for reintubation. In another study designed to assess the use of NIV in averting respiratory failure after extubation in patients at increased risk, Ferrer et al22 conducted an RCT in 162 mechanically ventilated patients who tolerated an SBT but had increased risk for respiratory failure after extubation (see Table 4). In the NIV group, respiratory failure after extubation was less frequent and ICU mortality was lower, but 90-d survival was not significantly different between the groups. The benefit was greater in patients with PaCO2 > 45 mm Hg. In a follow-up study, Ferrer et al23 conducted a multicenter RCT of 106 patients to determine whether post-extubation NIV improved outcomes in patients with hypercapnia. All patients had hypercapnia after a successful SBT. Respiratory failure after extubation was less frequent in patients assigned to NIV than in those allocated to conventional therapy (15% vs 48%, odds ratio 5.3, 95% CI 2.1–13.5). In patients with respiratory failure, NIV as rescue therapy avoided reintubation in 17 of 27 patients. NIV was associated with a lower risk of respiratory failure after extubation, and 90-d mortality was lower in patients assigned to NIV (Fig. 1). A meta-analysis24 of the studies by Nava et al21 and Ferrer et al22 shows that NIV significantly decreases reintubation rate and ICU mortality, but not hospital mortality, in patients who are at risk for developing post-extubation respiratory failure (Fig. 2). However, routine use of NIV immediately after extubation is not recommended.25,26 Su et al26 conducted a multicenter RCT in 406 patients on mechanical ventilation for > 48 hours, who tolerated an SBT, and were subsequently extubated. Patients were randomized to NIV or standard medical therapy. There were no differences in extubation failure (13.2% in control and 14.9% in NIV) or ICU or hospital mortality. Thus, preventive use of NIV after extubation routinely in all patients who pass an SBT is not beneficial in decreasing extubation failure rate or the mortality rate. There have been 2 RCTs of NIV for patients with established post-extubation respiratory failure.27,28 Keenan et al28 conducted an RCT to determine the effectiveness of NIV compared with standard medical therapy to prevent the need for endotracheal reintubation in 81 high-risk patients who developed respiratory distress during the first 48 hours after extubation. Comparing the NIV group with the standard-therapy group, there was no difference in the rate of reintubation (72% vs 69%) or hospital mortality (31% for both groups). No difference was found in duration of mechanical ventilation or ICU or hospital stay. Esteban et al27 conducted a multicenter RCT to evaluate the effect of NIV on mortality for 221 patients who developed respiratory failure after extubation. Patients in 37 centers in 8 countries who were electively extubated after at least 48 hours of mechanical ventilation, and who had respiratory failure within the subsequent 48 h, were assigned to either NIV or standard medical therapy. There was no difference between the NIV group and the standard-therapy group in the need for reintubation (48% in both groups). The ICU mortality rate was higher in the NIV group than in the standard-therapy group (25% vs 14%), and the median time from respiratory failure to reintubation was longer in the NIV group (12 h vs 2.5 h). In this study, patients could be crossed over to receive NIV even if they met reintubation criteria. It is of interest that reintubation was avoided in 21 of 28 patients (75%) who were crossed over to NIV. Moreover, the mortality was low in this group. This leaves one to wonder whether physicians selected these patients for a trial of NIV for some reason that caused them to suspect clinical success. The higher mortality in the Esteban et al27 study in the patients randomized to NIV was explained to be the result of delayed reintubation. However, additional analysis does not support this hypothesis.4 Patients assigned to NIV had a similarly increased mortality whether they were reintubated (relative risk 1.77, 95% CI 0.95–3.30) or not (relative risk 1.66, 95% CI 0.51–5.37). Multiple regression analysis indicates that both assignment to NIV and reintubation were independent predictors of mortality, with no evidence of an interaction between NIV and reintubation (P = .75). This means that NIV had the same effect on mortality in patients who were reintubated as those who were not. Thus, being assigned to NIV increased the risk of death, but not because of reintubation, and therefore not because of delay to reintubation. Thus, the reason for increased mortality in the NIV group is unknown. Esteban et al27 speculate that causes for the worse outcomes in the group receiving NIV, other than delayed reintubation, might include cardiac ischemia, respiratory muscle fatigue, aspiration pneumonia, and complications of emergency intubation. In the study by Girault et al11 of patients with hypercapnic respiratory failure, described earlier, reintubation rates were similar for invasive weaning, extubation to oxygen-therapy, and extubation to NIV. However, rescue NIV success rates for the invasive weaning and oxygen-therapy groups were 45% and 58%, respectively. These results suggest that rescue NIV might be useful to avoid reintubation when post-extubation respiratory failure occurs in the patient population of hypercapnic respiratory failure. The available evidence suggests that, in general, NIV is not effective in treating established post-extubation respiratory failure. However, this may not be true for patients with hypercapnic respiratory failure, such as patients with COPD. Strong consideration should be given to reintubation if the respiratory status of the patient is not improving over the first hour after initiation of NIV. A delay in reintubation as the patient struggles on NIV is not in the patient's best interest. It is difficult to place exact cut points to inform the need for reintubation. Rather, it is more important to examine the clinical trajectory of the patient: is it stable, improving, or worsening? If the clinical sense is that the patient is worsening, then reintubation should occur promptly. For example, reintubation should not be delayed if, after the patient has received NIV for 1 hour, the PaCO2 has increased by 10 mm Hg while the respiratory rate has increased by 10 breaths/min, and the SpO2 has decreased to < 90% despite an increase in FIO2 to 1. On the other hand, NIV might be continued if the FIO2 has been increased by 0.1 to maintain an acceptable SpO2, there is no increase in PaCO2, and the patient is breathing comfortably. A variety of interfaces are available for acute care applications of NIV, including the oronasal mask, nasal mask, nasal pillows, total face mask, and helmet.29 For acute-care applications the oronasal mask is most often preferred by clinicians and patients.30,31 Due to mouth leaks with a nasal interface, an oronasal or total face mask should be the initial interface for post-extubation NIV.32 A ventilator should be used with good leak compensation. This can be a ventilator designed specifically for NIV or a critical care ventilator with an NIV mode. A ventilator designed specifically for NIV may be preferred.33,34 It is also important that the ventilator displays respiratory parameters and waveforms, and has appropriate alarms for patient safety. Ventilator embellishments to improve synchrony are also helpful.35 In patients with neuromuscular disease, cough assist is useful following extubation.12 In patients with COPD, inhaled bronchodilators should be continued after extubation.36 What may be most important is the presence of clinicians at the bedside who are skilled and knowledgeable in the application of NIV and the adjustments necessary to improve patient comfort and tolerance. NIV has a role in the post-extubation period. Following are recommendations based on my review of the literature. NIV can be used to allow earlier extubation in selected patients who do not successfully complete an SBT. Its use in this setting should be restricted to patients who are intubated during an exacerbation of COPD or patients with neuromuscular disease. Patients should be good candidates for NIV and should be extubated directly to NIV. In patients who successfully complete an SBT, but are at risk for extubation failure, NIV can be used to prevent extubation failure. Patients should be good candidates for NIV and should be extubated directly to NIV. NIV should be used cautiously in patients who successfully complete an SBT, but develop respiratory failure within 48 hours post-extubation. In this setting, NIV is indicated only in patients with hypercapnic respiratory failure. Reintubation should not be delayed if NIV is not immediately successful in reversing the post-extubation respiratory failure. Evidence does not support routine use of NIV post-extubation. Dr Hess presented a version of this paper at the New Horizons Symposium, “The Ventilator Liberation Process: A Fresh Look at the Evidence,” at the AARC Congress 2011, held November 5–8, 2011, in Tampa, Florida. Dr Hess has disclosed relationships with Philips Respironics, ResMed, Breathe Technologies, and Pari. Editor in Chief Dean Hess was blinded to the peer review of this paper, which was managed by Deputy Editor Richard Branson. Copyright © 2012 by Daedalus Enterprises Inc.
. Clinical practice guidelines for the use of noninvasive positive-pressure ventilation and noninvasive continuous positive airway pressure in the acute care setting. CMAJ 2011;183(3):E195–E214.
. Non-invasive positive pressure ventilation (CPAP or bilevel NPPV) for cardiogenic pulmonary edema. Cochrane Database Syst Rev 2008(3):CD005351.
. Non-invasive positive pressure ventilation for treatment of respiratory failure due to exacerbations of chronic obstructive pulmonary disease. Cochrane Database Syst Rev 2004(1):CD004104.
. Noninvasive positive-pressure ventilation: a silver bullet for extubation failure? Respir Care 2007;52(11):1454–1456.
. Noninvasive ventilation to shorten the duration of mechanical ventilation. Respir Care 2009;54(2):198–208; discussion 208-211.
. Should a patient be extubated and placed on noninvasive ventilation after failing a spontaneous breathing trial? Respir Care 2010;55(2):198–206; discussion 207-208.
. Noninvasive mechanical ventilation in the weaning of patients with respiratory failure due to chronic obstructive pulmonary disease. A randomized, controlled trial. Ann Intern Med 1998;128(9):721–728.
. Noninvasive ventilation as a systematic extubation and weaning technique in acute-on-chronic respiratory failure: a prospective, randomized controlled study. Am J Respir Crit Care Med 1999;160(1):86–92.
. Noninvasive ventilation during persistent weaning failure: a randomized controlled trial. Am J Respir Crit Care Med 2003;168(1):70–76.
. Use of non-invasive ventilation to wean critically ill adults off invasive ventilation: meta-analysis and systematic review. BMJ 2009;338: b1574.
. Noninvasive ventilation and weaning in patients with chronic hypercapnic respiratory failure: a randomized multicenter trial. Am J Respir Crit Care Med 2011;184(6):672–679.
. Extubation of patients with neuromuscular weakness: a new management paradigm. Chest 2010;137(5):1033–1039.
. Extubation. Respir Care 2002;47(4):483–492; discussion 493-495.
. Decision to extubate. Intensive Care Med 2002;28(5):535–546.
. Incidence and morbidity of extubation failure in surgical intensive care patients. Crit Care Med 1988;16(6):573–577.
. Independent effects of etiology of failure and time to reintubation on outcome for patients failing extubation. Am J Respir Crit Care Med 1998;158(2):489–493.
. Extubation outcome after spontaneous breathing trials with T-tube or pressure support ventilation. The Spanish Lung Failure Collaborative Group. Am J Respir Crit Care Med 1997;156(2 Pt 1):459–465.
. The outcome of extubation failure in a community hospital intensive care unit: a cohort study. Crit Care 2004;8(5):R322–R327.
. Outcomes of extubation failure in medical intensive care unit patients. Crit Care Med 2011;39(12):2612–2618.
. Occurrence and complications of tracheal reintubation in critically ill adults. Respir Care 2012;57(10):1555–1563.
. Noninvasive ventilation to prevent respiratory failure after extubation in high-risk patients. Crit Care Med 2005;33(11):2465–2470.
. Early noninvasive ventilation averts extubation failure in patients at risk: a randomized trial. Am J Respir Crit Care Med 2006;173(2):164–170.
. Non-invasive ventilation after extubation in hypercapnic patients with chronic respiratory disorders: randomised controlled trial. Lancet 2009;374(9695):1082–1088.
. Role of noninvasive positive-pressure ventilation in postextubation respiratory failure: a meta-analysis. Respir Care 2007;52(11):1472–1479.
. Preventive use of noninvasive ventilation after planned extubation. Respir Care 2012;57(2):318–320.
. Preventive use of noninvasive ventilation after extubation: a prospective, multicenter randomized controlled trial. Respir Care 2012;57(2):204–210.
. Noninvasive positive-pressure ventilation for respiratory failure after extubation. N Engl J Med 2004;350(24):2452–2460.
. Noninvasive positive-pressure ventilation for postextubation respiratory distress: a randomized controlled trial. JAMA 2002;287(24):3238–3244.
. Interfaces and humidification for noninvasive mechanical ventilation. Respir Care 2009;54(1):71–84.
. A European survey of noninvasive ventilation practices. Eur Respir J 2010;36(2):362–369.
. Controlled trial of oronasal versus nasal mask ventilation in the treatment of acute respiratory failure. Crit Care Med 2003;31(2):468–473.
. Interface strategy during noninvasive positive pressure ventilation for hypercapnic acute respiratory failure. Crit Care Med 2009;37(1):124–131.
. Patient-ventilator asynchrony during noninvasive ventilation: a bench and clinical study. Chest 2012;142(2):367–376.
. Know your ventilator to beat the leak. Chest 2012;142(2):274–275.
. Patient-ventilator interaction during noninvasive ventilation. Respir Care 2011;56(2):153–165; discussion 165-167.
. The mask for noninvasive ventilation: principles of design and effects on aerosol delivery. J Aerosol Med 2007;20(Suppl 1):S85–S98; discussion S98-S99.